This article is about the US state. For other uses, see Washington (disambiguation). Washington is a state in the Pacific Northwest region of the United States. 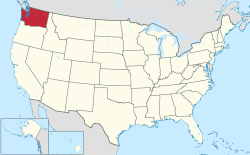 It is north of Oregon, west of Idaho, east of the Pacific Ocean, and south of British Columbia. (British Columbia is part of Canada.) There are more than 6,000,000 people in Washington. Most live in the western part of Washington, which gets more rain. About a quarter of the people live in the east part, where it gets less rain, and some parts have a desert climate. The largest city on the east part is Spokane, and it is also the second biggest city in the state. The Cascade Mountains go down the middle of the state and break it into two sides. The state's nickname is the "Evergreen State" because it has a lot of pine trees. Washington was the 42nd state to join the United States, on November 11, 1889. It is often called "Washington State" so that it does not get confused with the nation's capital, Washington, D.C. The name "Washington" comes from President George Washington. The capital of Washington is Olympia. Olympia is a small city on the west side of Washington, at the south end of Puget Sound. Washington's biggest city is Seattle, Seattle is also on Puget Sound. Washington has many beautiful forests, rivers, gorges (gorges are small canyons), and mountains. Because it's next to the ocean, it has a long beach. However, because Washington is north of Oregon and California (the other two states on the West Coast of the United States), the ocean is cold, and usually not good to swim in. The biggest universities in Washington are the University of Washington and Washington State University. The University of Washington is in Seattle. Washington State University is in a small town called Pullman. Pullman is on the east side of the state. The state of Washington has an extremely varied geography, and therefore an extremely varied climate. The map shows western cities have shipping access. These are the low-lying parts on the next to the Pacific Ocean. The western side of the mountains is wet and forested with conifers. Some areas are temperate rain forests (in the Olympic Mountains). The central area is mountainous, including five volcanos: Mount Baker, Glacier Peak, Mount Rainier, Mount St. Helens, and Mount Adams. To the east of the mountains the land is dry and mostly dry grassland (high plains). Only one feature links the west to the east: the important Snake River, a tributary of the even larger Columbia River. Wikimedia Commons has media related to Washington (state). ↑ "State Symbols". Washington State Legislature. Retrieved July 11, 2014. ↑ "Idaho is Nation's Fastest-Growing State, Census Bureau Reports". US Census Bureau. December 20, 2017. ↑ "About the University". University of Washington. 2008. Retrieved September 28, 2009. This page was last changed on 8 February 2019, at 18:37.